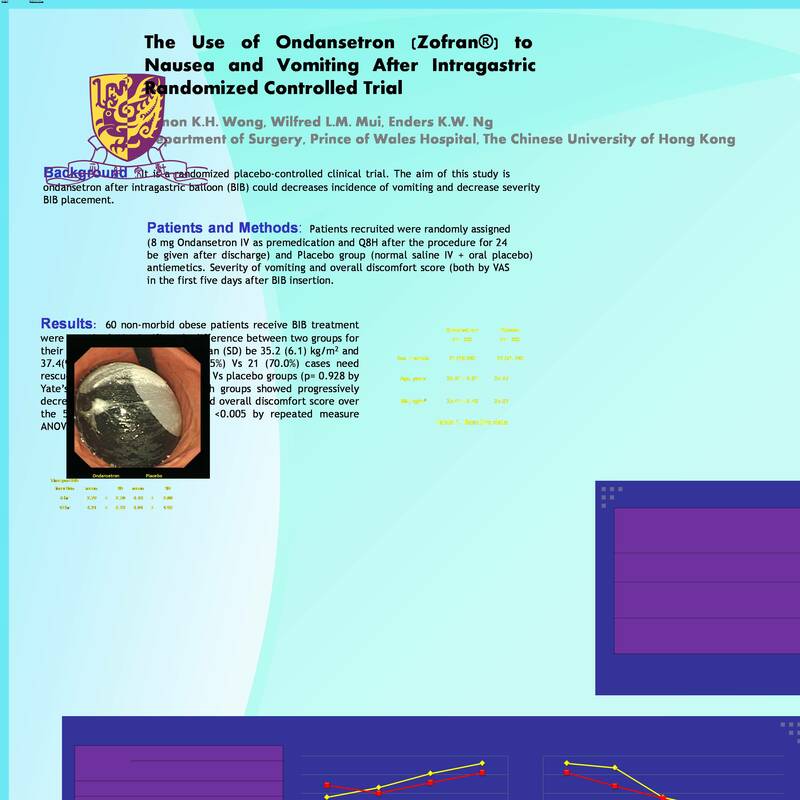 Objective: The aim of this study is to investigate whether the use of the intravenous ondansetron after intragastric balloon (BIB) could decreases incidence of vomiting and decrease severity of nausea and improve patient’s tolerance to BIB placement. Methods: consecutive patients were randomly assigned and double blinded into two groups as Zofran group (8 mg Ondansetron IV as premedication and Q8H after the procedure for 24 hours. Oral ondansetron 8mg t.i.d for two days will be given after discharge) and Placebo group (normal saline IV + oral placebo). IV Metoclopamide 10mg Q6H PRN as rescue antiemetics. Severity of vomiting and overall discomfort score (both by VAS score) and the usage of rescue drug were assessed in the first five days after BIB insertion. Results: 60 non-morbid obese patients receive BIB treatment were recruited. No significantly difference between two groups for their baseline BMI and age with mean (SD) be 35.2 (6.1) kg/m2 and 37.4(9.6) years. Ninteen (65.5%) Vs 21 (70.0%) cases need rescue antiemetics for Ondansetron Vs placebo groups (p= 0.928). Both groups showed progressively decrease in severity of vomiting and overall discomfort score over the 5 days assessment period (p <0.005). First day post BIB placement was found to have highest severity of vomiting and discomfort among the 5 days assessments. Severity of vomiting dropped significantly from Day 1 to Day 5 post insertion with mean(SD) VAS score of 5.3(2.4) into 2.1(1.9) (p < 0.005). No significant difference between severity of vomiting and overall discomfort were found between the two groups (p = 0.7 and 0.433 respectively). Conclusions: Usage of intravenous ondansetron as a mean to relieve postoperative nausea and vomiting after intragastric balloon placement was questionable. No evidence showed in the current study that it is an effective means to improve patient satisfactory and tolerance to the procedure.